This and 8 other objects are a part of a set whose first object is Tricorne and Streamline Tableware, 1934. This is a Creamer. It is dated 1934 and we acquired it in 2016. Its medium is molded and glazed earthenware. It is a part of the Product Design and Decorative Arts department. 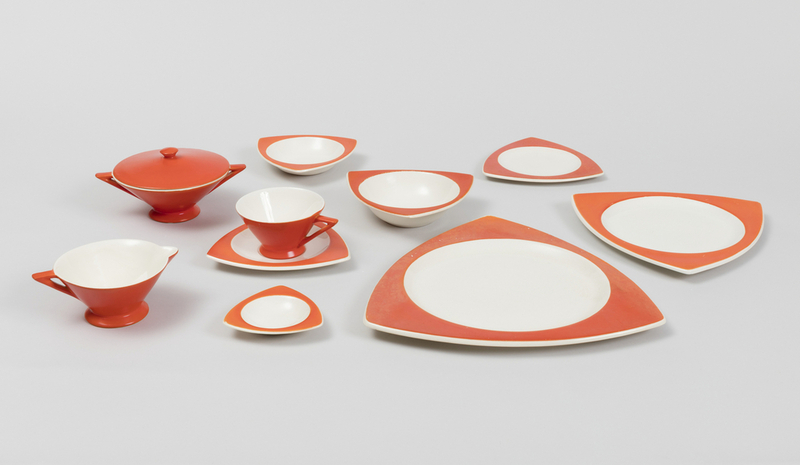 Don Schreckengost created the Tricorne ceramic tableware as a nineteen-year-old student with The Salem China Company. Tricorne was often sold alongside the Streamline shape. The Salem China Company partnered with Warner Brothers and hired movie stars to sit for publicity photographs taking tea with Tricorne and Streamline. These promotions, as well as Tricorne and Streamline’s modern color and pattern serve as reminders of the strategies that manufacturers enacted to maintain a profit during the Great Depression.